Struggles In Steel (1996, 86 min) - Braddock Films, Inc. When a local television station did a program about the closing of the major steel mills in the Pittsburgh region, Ray Henderson, a former mill worker who had worked in the mills for 18 years, couldn’t help but notice that not one black worker was shown. This despite the fact that African-American workers had formed a critical part of the labor force in western Pennsylvania for 125 years. With his old friend and independent filmmaker Tony Buba, Henderson set out to collaborate on a history of African-Americans and their contributions not just to the steel industry, but to the labor movement itself. Through eloquent living witnesses and revelatory archival footage, Struggles In Steel presents a striking counterpoint to the stereotypical black male image. Struggles In Steel premiered at the 1996 Sundance Film Festival, has played in major festivals in the United States, and screened at FESPACO in Burkina Faso in West Africa – the largest African film festival in the world. In addition, Struggles In Steel was awarded a 1999 Silver Baton, the Alfred I. duPont-Columbia University Award. 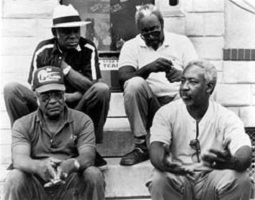 Featuring interviews with over 70 African-American workers, Struggles In Steel: A Story of African-American Steel Workers documents the shameful history of discrimination against black workers and one heroic campaign where they won equality on the job. Struggles In Steel is distributed by California Newsreel. If you wish to purchase a copy for personal use, please visit our online store here: Struggles In Steel DVD. The Study Guide is great for classroom use. It contains information about African-Americans in the steel mills, discussion questions relating to Struggles in Steel , and more! Raymond Henderson is a former steelworker who had 18 years of service in the Duquesne Steel Mill, outside of Pittsburgh, when the plant shut down. During his years in the mill, he was a grievance man, active in the civil rights movement and constantly working to establish equal rights for his co-workers. 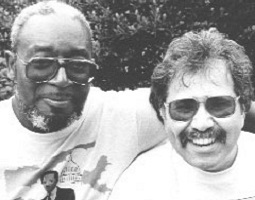 He began taking oral histories from African-American steelworkers in 1987. A long-time community activist, Henderson was Board President of the local NAACP chapter for 12 years. He is also on the board of the Braddock’s Field Historical Society, worked as a child advocate in the schools, and as an outreach worker for Victims of Violent Crime.